A doctor who treated Michael Schumacher for nearly six months after his brain injury in a skiing accident says the F1 champion has made "some progress". But Jean-Francois Payen, a doctor at the French hospital in Grenoble where he was treated, warned that any recovery would take time. The typical convalescence period was one to three years, he suggested. 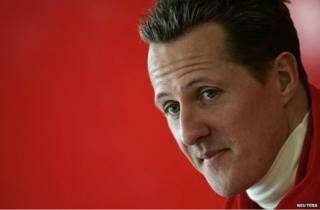 Schumacher, 45, was skiing in the French Alps last December when he fell and hit his head on a rock. The seven-time world champion from Germany was placed in a medically induced coma to help reduce swelling in his brain as he underwent treatment in Grenoble and then in Lausanne, Switzerland. He has now been taken out of the coma and is being looked after at his home in Gland, Switzerland, where Prof Payen still visits him to track his progress. On Thursday, the doctor gave interviews to French radio station RTL and Le Parisien newspaper. "I have noted some progress but I would say we should give him time," he said. Asked about the chances of Schumacher making a recovery, he only referred to a time frame for patients with similar brain injuries. "It's like for other patients, we are on a timescale which goes from one year to three years and we need to be patient," he said. Earlier this year, neurosurgeon Tony Belli told BBC News that rehabilitation from this sort of injury could take months or years. "We know that some people can spend three, four years in rehabilitation," he said. "It depends very much on the severity of the injury, how young and fit they are." Investigators probing last December's accident said Schumacher had been going at the speed of "a very good skier" at the time of his crash in the resort of Meribel. A French F1 driver, Jules Bianchi, remains in a critical condition in hospital in Japan after suffering severe brain injuries when his car skidded off a wet track on 5 October. Michael Schumacher injury: How dangerous is off-piste skiing?